The most absorbent Depend there is for great overnight protection. When my Dad moved in with me so I could care for him I knew managing his incontinence was going to be a challenge. However, I was surprised to learn the biggest challenge wasn’t during waking hours but rather at night. Dad was waking up several times during the night needing to change his incontinence product. Often times I had to come in and change bed linens as well in order for him to have a dry bed to go back to. This was becoming exhausting for both of us and I wondered what incontinence supplies I could buy that would allow Dad and I to get the rest we both needed. It wasn’t until I called the ladies at The Caregiver Partnership and learned about Depend Protection with Tabs I realized there was an answer for a better night's sleep. It can be overwhelming to try and determine exactly what incontinence supplies you or the loved one in your care may need. There are more choices than ever before and they’re changing all the time. This creates more confusion. The Caregiver Partnership understands this and have created an easy to use style guide which explains all the style options which can help you determine what incontinence products are right for you or you can call and speak with one of their knowledgeable ladies. After talking to the knowledgeable specialists at The Caregiver Partnership I realized Depend Protection with Tabs was the answer I was looking for. Depend has a long history of reliability all the way back to the late 1970’s. I felt it was a brand I could trust. In addition, at The CareGiver Partnership I could save up and use 3 coupons per case which meant they would be affordable for my Dad. Just a few weeks ago, Depend offered a $3.00 coupon in the paper off one bag. I got ahold of 3 coupons and saved $9.00 off a case. There were other reasons to consider using Depend Protection with Tabs. Here are 3 of the reasons. Depend Protection with Tabs offers the ultimate in protection. Whether you are looking for better overnight protection or need protection for someone who has heavy incontinence this can be the right incontinence product to meet those needs. Depend Protection with Tabs offers the most protection of any of the incontinence product the Depend brand offers. Depend Protection with Tabs has Six EasyGrip Tabs which refasten for better fit. 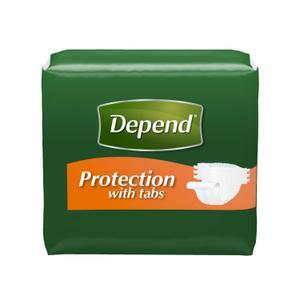 The makers of Depend understand protection in an incontinence product is dependant on its fit. When any type of incontinence supplies is too big or too small it puts the wearer at risk for leakage and accidents. Because 80% of all leaks occur at the rear buttocks area it is extremely important any incontinence product fits well. To help improve the fit Depend Fit with Tabs has their patented Six EasyGrip Tabs which can be refastened for the most precise fit possible. This also makes it more convenient for caregivers who need to change an incontinence product. Depend Protection with Tabs has built in protection from leakage and odor. This incontinence product has the improved Ultra Absorb-Loc protection which will quickly absorb fluids and lock it away in the core. It will also neutralize odor. Depend Protection with Tabs also has gentle latex free elastic leg gathers which improve fit and thereby improve the protection. For even more protection, use Depend protection with tabs in combination with Depend Seat Covers or Bed Protectors. Learn more.